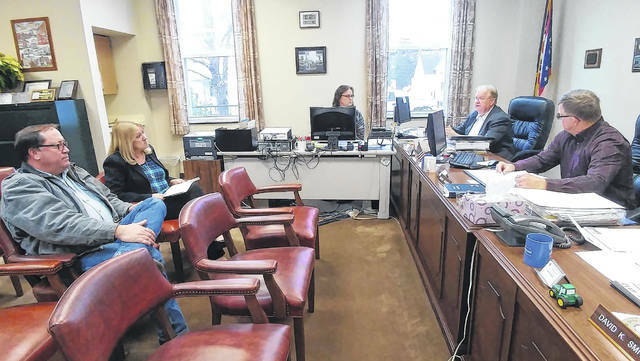 New Ohio Department of Transportation District 10 Deputy Director Darla Miller, upper left, addresses the Gallia Commissioners Thursday with Jackson Pike ODOT Transportation Administrator Mark Kirkhart, lower left. Gallia Commissioners Harold Montgomery, upper right, and Brent Saunders, lower right, share concerns with upcoming county sewer renovations. Not pictured, Commissioner David Smith. GALLIPOLIS — Newly installed Ohio Department of Transportation District 10 Deputy Director Darla Miller and Ohio Department of Transportation District 10 Transportation Administrator Mark Kirkhart attended the Gallia Commissioners regular meeting Thursday morning to discuss coming projects in the region. Miller discussed a coming transportation study around the U.S. 35, State Route 7 and State Route 735 interchange to examine potential improvements to the system’s traffic flow. According to a letter provided by the commissioners and meeting discussion, the study’s purpose seeks to identify potential problem areas of safety and to consider congestion improvements based on analysis of traffic and then provide a final report with recommendations. A local stakeholder group will be created to seek input and participation among local bodies. Because improvements could have an effect on the area roadway network and access to new and existing developments, the group exists to talk about local priorities, issues and to get input if alternatives need suggested. The first stakeholder meeting is slated for Dec. 13 from 3 to 4 p.m. and will be held on the second floor of the Gallia Courthouse. An ODOT consultation team will introduce itself and then discuss and produce information on current road conditions, objectives and speak on potential conceptual alternatives. Miller and Kirkhart discussed a coming roundabout project to be placed at the intersection of Ohio 325 and 588 and how that would be another major focus for local ODOT concerns in the coming years. Both commissioners and ODOT representatives agreed information would need disseminated in order to better educate the public on how to utilize a roundabout as that seemed to be a chief concern among the public. According to previously gathered information, the project will cost the state around $733,000. Rio Grande will provide five percent of $370,000 for the construction of sidewalks near the intersection and surrounding roads after being awarded project funding from the transportation alternatives program. Roundabouts are considered a type of circular intersection where traffic continues to flow in one direction about a central point. Entering traffic is to yield to traffic already moving in the circle. Such motions are to minimize T-bone crashes as well as head-on collisions. Traffic continually moves in one direction so that pedestrians only have to watch one direction when crossing the road.